Let us help you make a customized gift basket. All you need to do is tell us your budget and our staff will provide you with a variety of options of great products. We also have several pre-set themed baskets which include: local artisan products, a taste of switzerland, award winning cheeses, and Green County specialties. We carry a vast assortment of cheeses from Wisconsin. 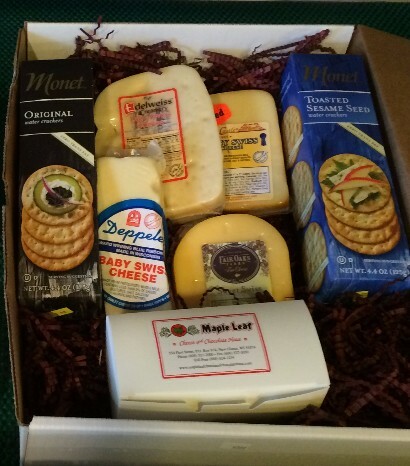 We can help pair your cheeses with locally produced jams, crackers, chocolate, and imported specialties. 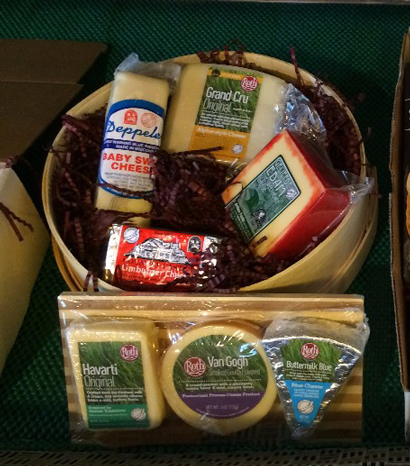 Gift baskets can be ordered in store, by phone at 608-527-2000, or by email at mapleleafcheese@gmail.com. Gift baskets may be picked up in our New Glarus store, shipped to any location in the U.S., or delivered locally.